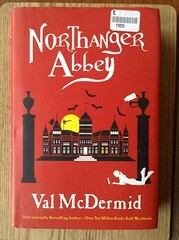 Val McDermid’s retelling of Jane Austen’s Northanger Abbey. I’ve not read the original. Even with Val McDermid’s 21st century update, I found the characters rather thin. Falco and Helena return to Rome after their adventures in Germania, straight into the bosom of Falco’s difficult family. An army friend of his elder brother, Festus – who died a hero’s death in the Judean War – has lodged himself in Ma’s home and proceeds to make trouble for the Didius family, and Falco in particular. 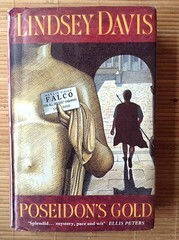 We get to meet Falco’s errant father, Geminus, too and end up spending a lot of time in the company of The Didius Boys in a plot that revolves around stolen art, Mediterranean shipping, soldiers’ pay, Greek statues and auctions. Fabulous! 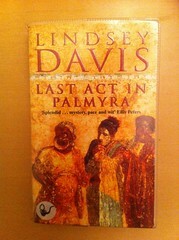 We’re off to Palmyra next…. Roman private eye, Marcus Didius Falco, tangles with the nouveau riche of the Pincian Hill, and his ensuing investigation brings him into the nefarious realms of rogue developer landlords and a professional bride trailing three deceased husbands in her wake.